RAF Spitfire display pilot Squadron Leader Clive Rowley was about to land the Battle of Britain Memorial Flight's PR XIX, PS915, in the Isle of Man in July 2002 when he discovered that the undercarriage would not come down: the pins that lock the gear in the up position were not withdrawing. After trying unsuccessfully to 'unstick' them he sought the advice of the Flight's technicians travelling in its Douglas Dakota as part of the display team. They told him to try flying straight and level - inverted. It worked, and the hydraulics "lowered" the undercarriage upside down, whereupon he could roll out and land normally. Clive commissioned my picture to accompany an article in the Flight's 2018 Yearbook. 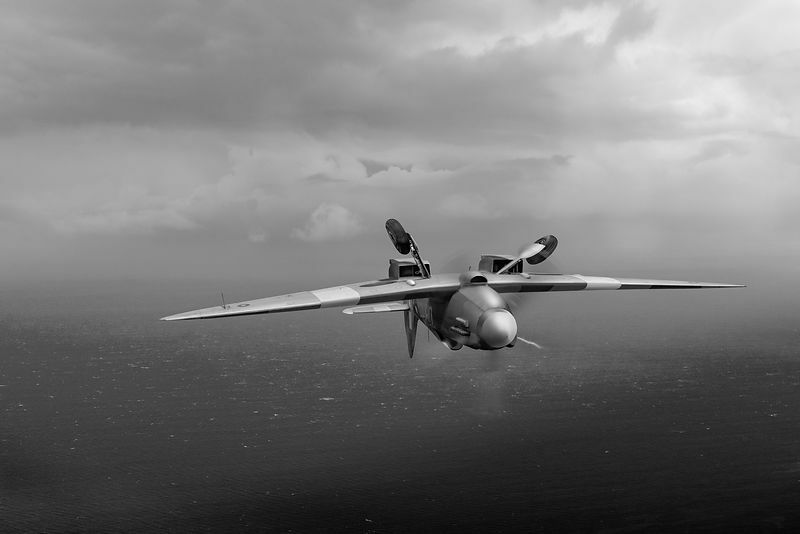 At the time of the incident, PS915 was painted to represent a 152 Squadron SEAC (South East Asia Command) Mk XIV Spitfire coded UM-G, which carried the squadron’s leaping black panther on the fuselage.